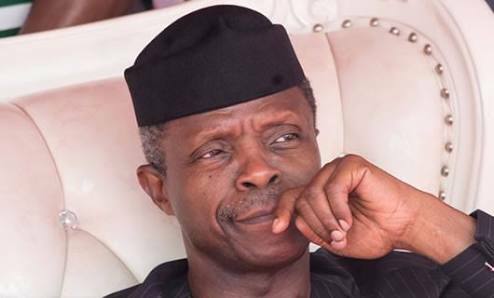 VP Osinbajo to Obasanjo, Others: How Did You Spend Oil Money? Vice-President Yemi Osinbajo says the problems facing Nigeria are not about restructuring as being suggested in many quarters. He also wondered how past Nigerian leaders, including former Presidents Olusegun Obasanjo, Goodluck Jonathan and others spent the oil revenues that accrued to the country during their administrations. According to a statement on Monday by his Senior Special Assistant on Media and Publicity, Mr Laolu Akande, the Vice-President said these while answering questions from Nigerians at a town hall meeting in Minnesota, the United States of America, on Sunday. Osinbajo said Nigeria’s problems were not about geographical restructuring but about proper management of the country’s resources. He said, “The problem with our country is not a matter of restructuring and we must not allow ourselves to be drawn into the argument that our problems stem from some geographical restructuring. It is about managing resources properly and providing for the people properly, that is what it is all about. “I served for eight years as Attorney General in Lagos State and one of the chief issues that we fought for in Lagos State was what you call fiscal federalism. We felt that there was a need for the states to be stronger, for states, to more or less, determine their fortunes. “So, for example, we went to court to contest the idea that every state should control, to a certain extent, its own resources (the so-called resource control debate). We were in court at that time up to the Supreme Court and the court ruled that oil-producing states should continue to get 13 percent derivation. “While we were at the Supreme Court only the oil-producing states and Lagos were interested in resource control, everybody else was not interested in resource control for obvious reasons. Osinbajo said his view was that the government must create an environment that would allow people to realise their economic potential. In June, Osinbajo had said that the present administration was not opposed to restructuring as being canvassed in many quarters. Osinbajo stated this while addressing traditional rulers from Ekiti State at the palace of the Ewi of Ado-Ekiti, Oba Rufus Adejugbe, ahead of the governorship election in the state. He had said, “I want to say that this country is strongest, this country is best when we are one, when we are united. It is a united country that can make a difference. “We are fully in support of any form of restructuring that benefits the people of our country. “That is why, for example, the President just signed this into law, a bill which enables Houses of Assembly to be autonomous; so that their finances are autonomous. This is some form of devolution of powers. “We are also keenly supportive of anything that gives a measure of independence for states so that the states can realise their own potential and do very well for themselves in every way. The President is keenly supportive of all of those things. In August last year, Osinbajo also denied media reports that quoted him as describing proponents of restructuring as political jobbers. He then went ahead to describe the restructuring debate as an important one. Osinbajo said, “Under the IBB/Abacha administrations (1990 – 1998), Nigeria realised $199.8bn. “Under the Obasanjo/Yar’Adua governments (1999-2009), the country got $401.1bn. “During the Jonathan administration (2010-2014), Nigeria got $381.9bn from oil revenues. “The question that we must all ask is that what exactly happened to resources? The question that I asked is that where is the infrastructure? Is it that Nigeria didn't make any money under Abdulsalam's government or they are just skipping that for a reason? Government matter.